Time for a Garden Journal Update of my early June garden. Right now the garden is lush with colors of green everywhere. The spring flowers are starting to be replaced by summer blooms, and the veggie garden is off to a good start. One of the most prevalent plants in my garden are the succulents. 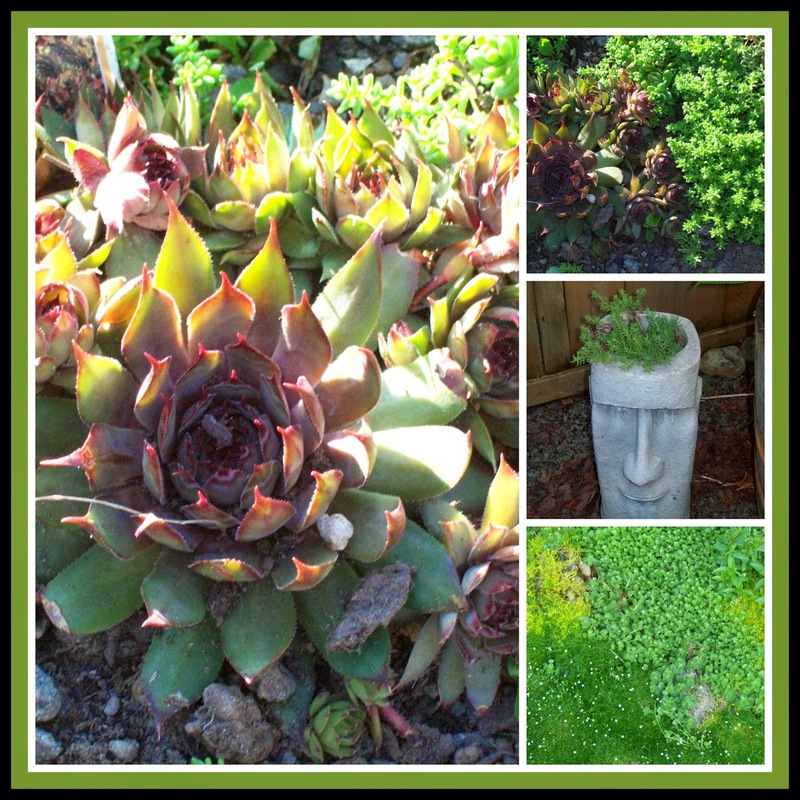 I have been growing succulents for years, my first home was an old house built around 1920 and it was planted with a very beautiful and mature garden, one of my favorite plants at my old house were the hens and chicks that had grown for years along a rock garden. Ever since then I have included hens and chicks, along with any other succulents I can find, in all of my gardens over the years. My back garden was designed as stone raised beds with gravel paths, to avoid the very soggy grass garden most of my neighbors contend with. My succulents have been right at home among the stones, rocks, and gravel paths. I have hens and chicks, multiple varieties of sedum, including lots of baby tears sedum. Here are some of the patches growing throughout the garden. 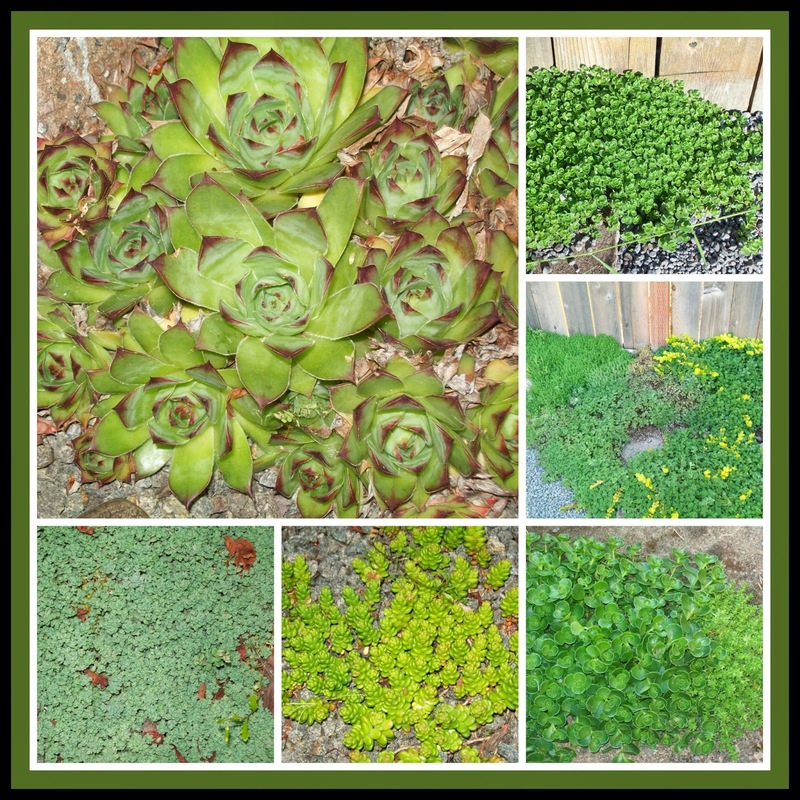 Everywhere that I want ground cover I plant succulents, it does a nice job keeping the weeds down, and intermingles nicely with my other ground covers, like my moss garden and my creeping jenny. It also makes a nice plant for my Easter Island head planter. :) Succulents are so easy to grow, and after they take hold you will find them spreading nicely throughout the garden. 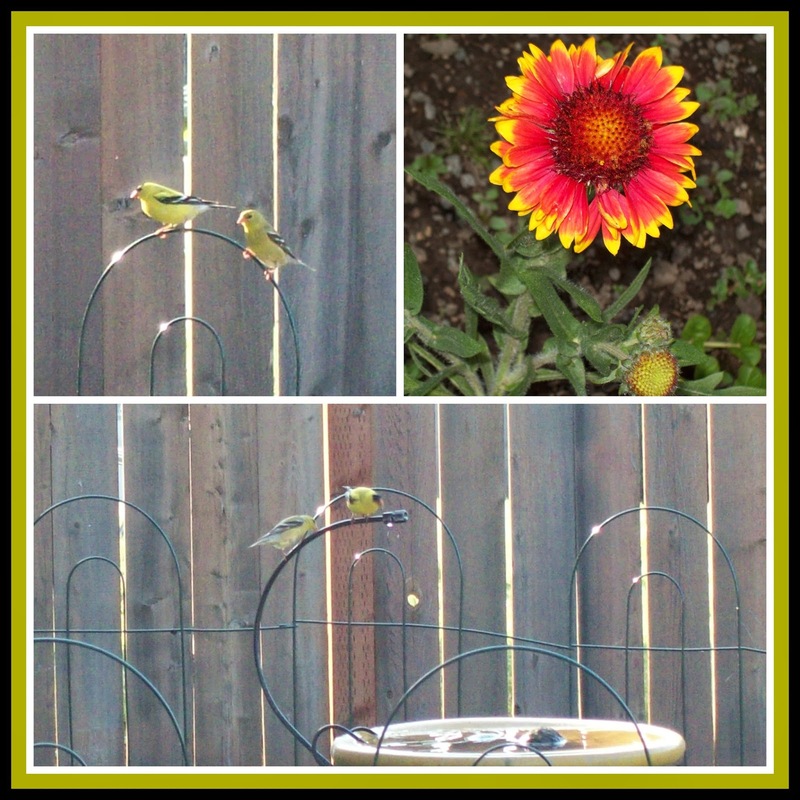 They do well in the hot sun, and also seem to tolerate our wet pacific northwest weather, all around a wonderful plant to add to the garden! My hydrangea that I put in last year is doing wonderfully, and is just starting to bloom, it really looks beautiful in the back corner of my side garden. 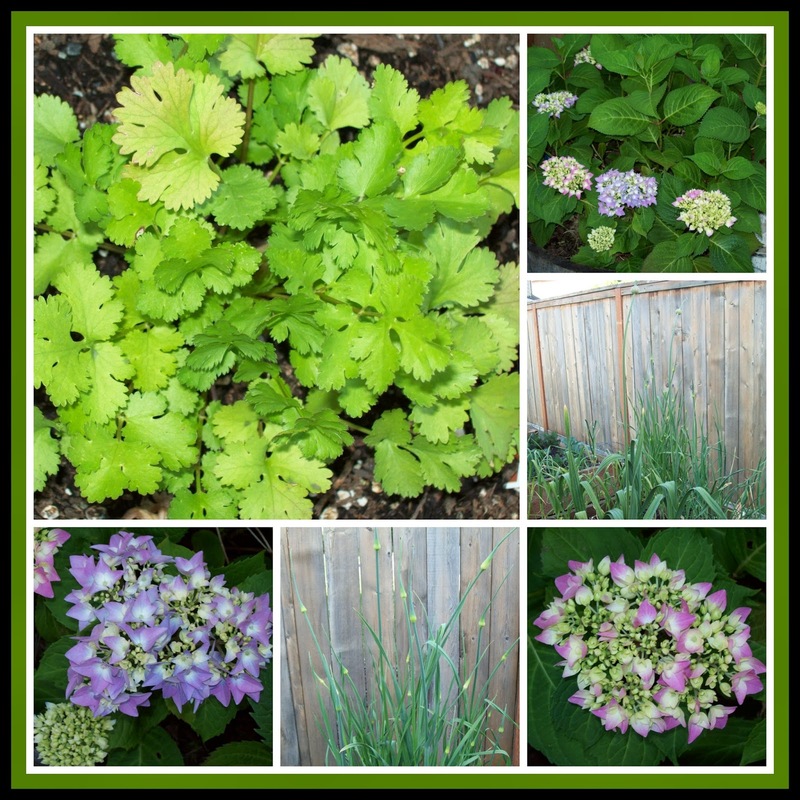 In my veggie garden the cilantro is looking beautiful and bright green, I am really looking forward to cooking with it this summer. The leeks that took more than a year to grow, but never got big enough to use, have sent up flower heads. I have heard this makes the leek too tough to use, I may still try one anyway since I waited so long for them to grow. Otherwise I will let them flower, and collect the seed and perhaps try again. The Elephant garlic has also sent up its flower and they are taller than me! I cut two of the flowers off, and left two on to see if it makes a difference in bulb size. 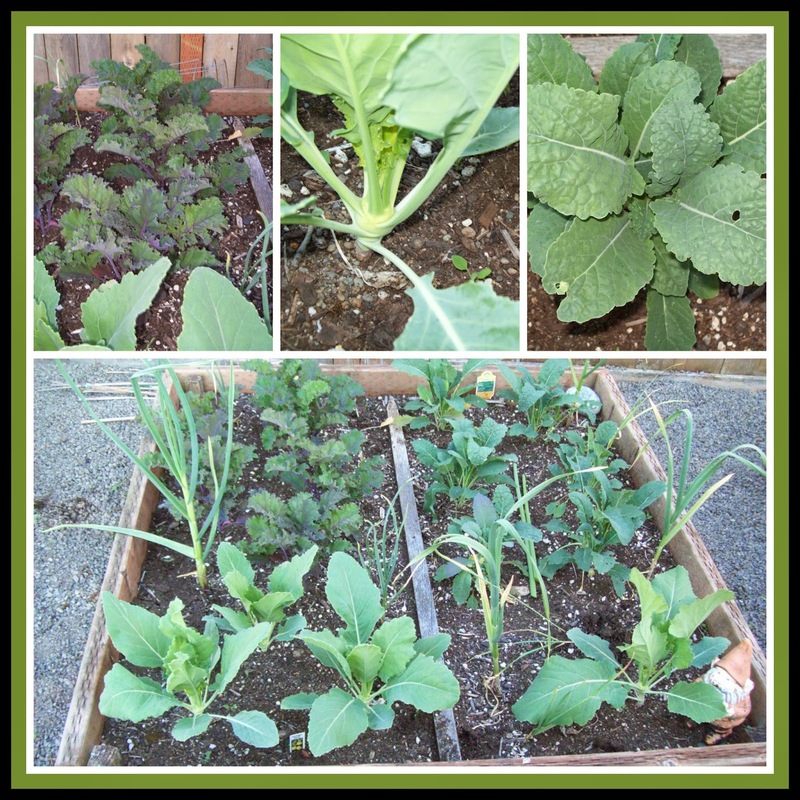 The Kale and Kohlrabi plants are doing great. The kohlrabi as starting to form its round stem, and the kale almost looks big enough to start picking some. Kale is my new favorite veggie and I have been serving it for dinner at least once a week lately. Last week I made Sausage Kale and Mushroom pizza, and it was delicious! Not sure the kids were completely convinced about Kale on pizza, but I loved it! I used thin crust refrigerated pizza dough, you could make your own dough though. Before assembling the pizza I cooked a pound of sausage, drained it and set it aside, sauteed the Kale in a little olive oil, and sauteed the mushrooms in a little olive oil with Italian herbs. I also heated some olive oil, about 1/3 cup in a sauce pan with three cloves of garlic pressed through the garlic press. I pre-baked the crust according to package directions for about five minutes I baked the crust on a parchment lined baking sheet, then using a pastry brush spread half the garlic oil on the crust ( I made two pizzas so use the other half for the second pizza) then I sliced up some mozzarella, like 1/4 inch slices, and tore them up into good size chunks to place around the crust, then I added half the sausage and mushrooms, and then half the Kale, then topped with more mozzarella. Bake until crust is cooked through and cheese has melted, like 10 minutes or so. While the first pizza was baking I made the second pizza. I love making pizzas like this in the summer, they are fairly quick to make and you can use some of the garden veggies. Last summer I made a Garden Fresh Pizza with fresh basil and zucchini. 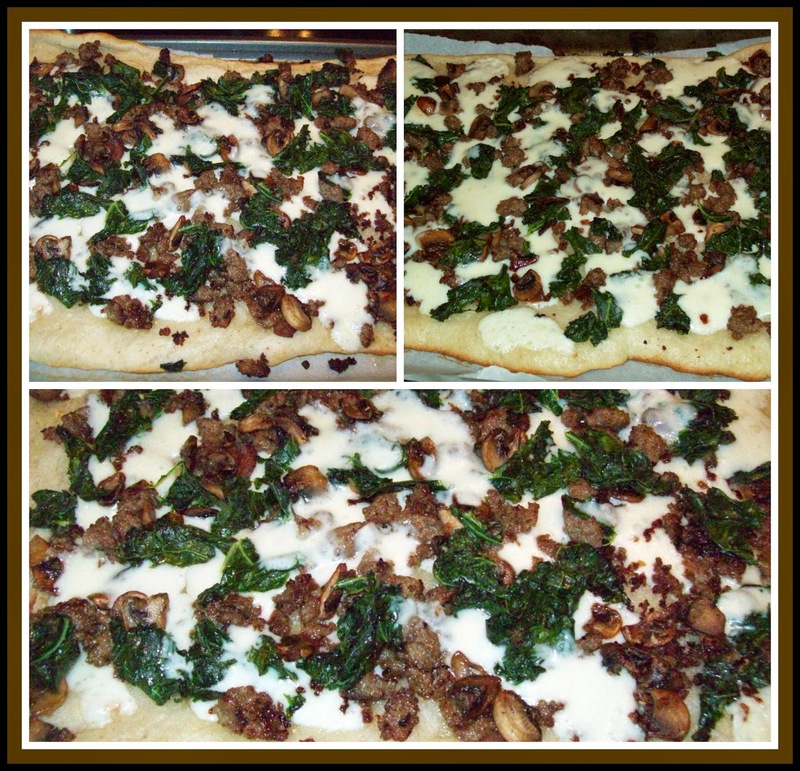 Here's how the Sausage Kale and Mushroom pizza looked. Sausage Kale and Mushrooms is one of my most favorite flavor combinations, you might also like my Sausage and Kale Hand Pies recipe, or my Sausage and Kale and Mushroom Alfredo. Anyone else growing Kale in your gardens? How do you like to use Kale? Oh, yes, the gardens look so wonderful in all their shades of green and even brighter and more beautiful after a spring shower. You have given us another Kale recipe~thank you~I love Kale. I used it once in calzone, have put it on pizza, but love best it either in mashed potatoes or just plain and tossed with butter and maybe a grating of nutmeg. So much going on in and around your place! I should try Kale...don't know much about it. Do you eat it in salads? On Pizza sounds good. I like spinach pizza, is that sort of the same thing? I just bought a pizza stone for the grill...I'd love to try this. Your succulents are so pretty! I like the idea of succulents as ground cover. Today I purchased two at Lowe's on the $1 sale rack! I'm hoping they'll do well in the desert soil and weather.